Well it’s hardly brand new but it’s certainly taken some time to get us creatures of habit out of our skinnies! Some of us would have been wearing a high rise jean for some time (a skinny high rise). 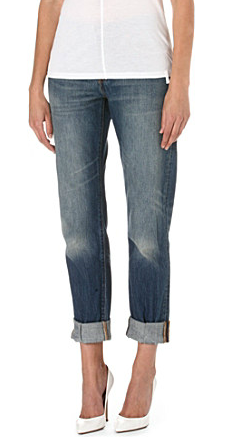 But how on earth have these skinnies fill up our jean rails for the last decade + ? Not a glimmer of hope or a bat of an eyelid for any other style. A much needed change of jean silhouette was needed, and what better way to bring the denim back to life with the best authentic, lived in real jean look that the likes of Levi’s, gave everyone back in the 70’s, a real bum, and a longer leg. Be it cropped or full length you absolutely have to get real again and get your non stretch, hard wearing, straight leg, high waisted jean on! Whilst sussing out some perfect pics to get you all onboard I came across two articles that I found highly entertaining and thought I would share a snippet of both. I have to say if you read the full article by Man Repeller, she doesn’t instil much confidence as far as the comfort levels go but believe me, mine are oh so comfy, and whilst the eating factor is absolutely true, if I eat a little I find myself with this little kangaroo type pouch between my button and my “you know what”. Regardless, Im in love! And if you can’t be forced into it all that just yet, I always swear by the high rise Jamie Jean, if you’ve been a client of mine you would of almost certainly have bought a pair on a shop! Vogue recently published an article about fashion items that are made to last (view it here). It’s something I think about all the time and get asked about all the time by my clients. Everyone out there will have a different opinion on what they would spend their money on and what items they would choose to own that would last forever. There are so many gorgeously important items that I believe get better with age and are almost not as nice new as they are after a couple of worn years. These are my picks on what I would invest in. 1.Goes without saying, a good quality leather handbag. Choose a colour that works for your wardrobe and a colour that is versatile and preferably neutral, grey, tan, black.. The older the leather gets the better the bag looks and feels. Two bags of my choice would be a tote and a smaller shoulder bag. 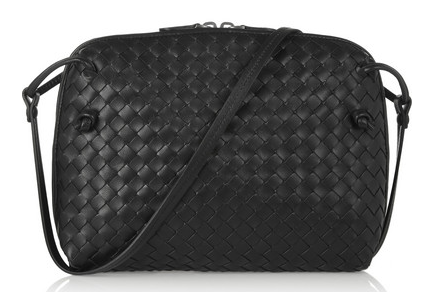 The Balenciaga classic has always been one of my personal fave’s, the fact that I still like it after about 10 years clearly means something and the Bottega Veneta shoulder bag as below. Both simple and classic. A beautiful evening bag with a gold or silver chain strap would be another favourite but in terms of getting more wear, these two would win. 2. 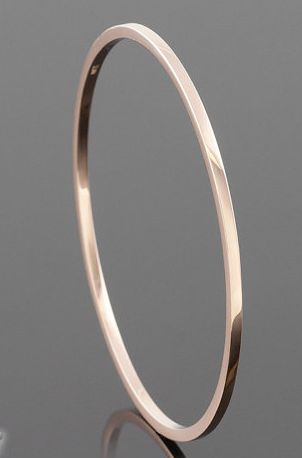 A good solid bangle, be it silver, gold, whatever metal you choose. I had the most beautiful rounded tube like silver bangle which fitted my wrist perfectly but it had an opening and somehow it fell off my arm, I have been so upset about it and am still hunting down the perfect bangle to take it’s place. I think this time I will replace it with a rose gold one. I like to find jewellery in unexpected places. So not your usual jewellery stores but at markets or on overseas trips. I think it is far more romantic and gives the pieces a bit of a story. Hence my search continues! 4. Leather Jacket. 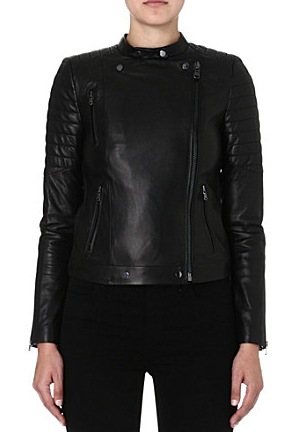 This specific leather jacket style I love but leather jackets don’t need to be devilishly expensive and you can find amazing leather jackets in vintage stores or on the high street. I have one vintage one which I bought the first year I arrived in London and two high street jackets which look and feel a lot more expensive than they were. In fact my black one looks almost exactly like the one below. 5. The perfect soft jumper. Now this is something that sadly won’t last as long (well not for public appearances anyway) so should be replaced every couple of years but is so important to have. The jumper should compliment you, not make you feel frumpy but at the same time you should be able to wear it any day of the week and feel not only cosy but also amazing. Jumpers should not drown your figure or be pilled. Hopefully this will help you think again when you want to buy another cheap fashion item. Don’t get me wrong I am all for trends and buying what’s in now but maybe it’s time to invest in a few good pieces too every now and then. 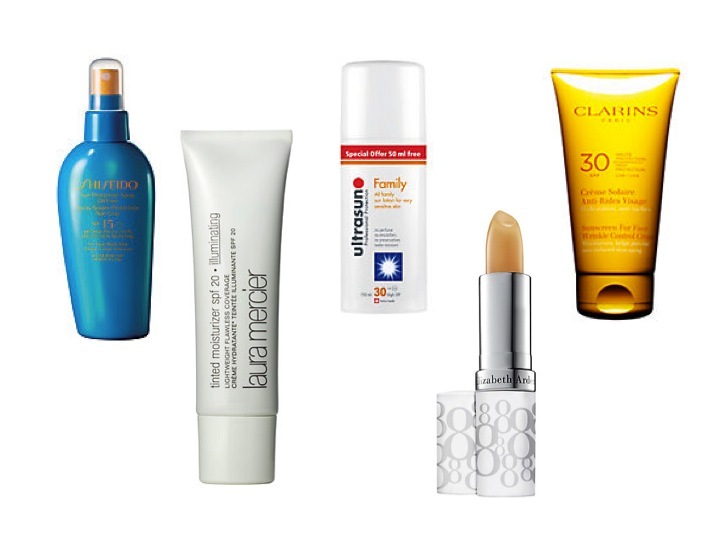 You don’t need more than 3 sunblocks, one for the entire family, one for the face, this Clarins one we love as it’s non oily and works really well. I like a spray for my body rather than cream, its easier and quicker to apply. When it comes to make-up, as with everything else, less is more. All you need is a tinted moisturiser and a good lip balm. Forget the mascara, blusher, hair spray etc, it all slides off in the heat anyway and sea water does wonders to give you those bouncy beach curls. Do ensure to condition everyday to protect the hair. 2 or 3 bikinis/costumes is ample. Make sure you can mix and match the tops and bottoms and it will feel like you are wearing a different one everyday. I always take more bottoms and maybe two tops but make sure the bottoms can go with all the tops. Get a mix and match of your favourite tones going. 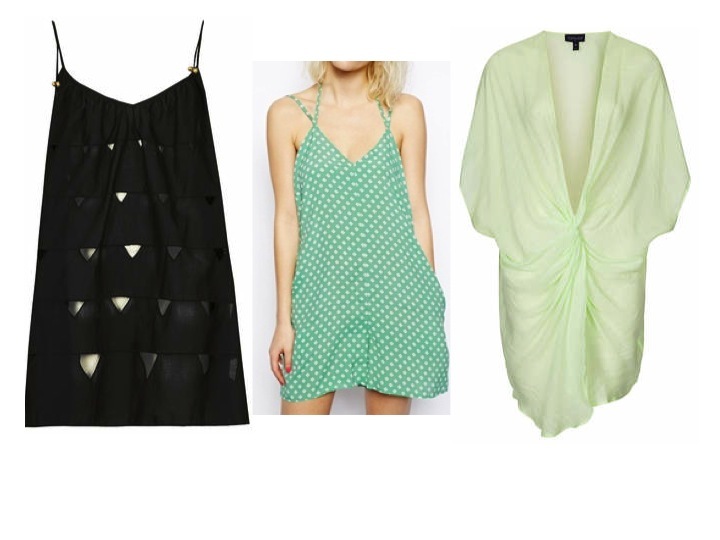 Dress or playsuit cover ups are easy to pack and it means you are packing one item rather than tops and bottoms. 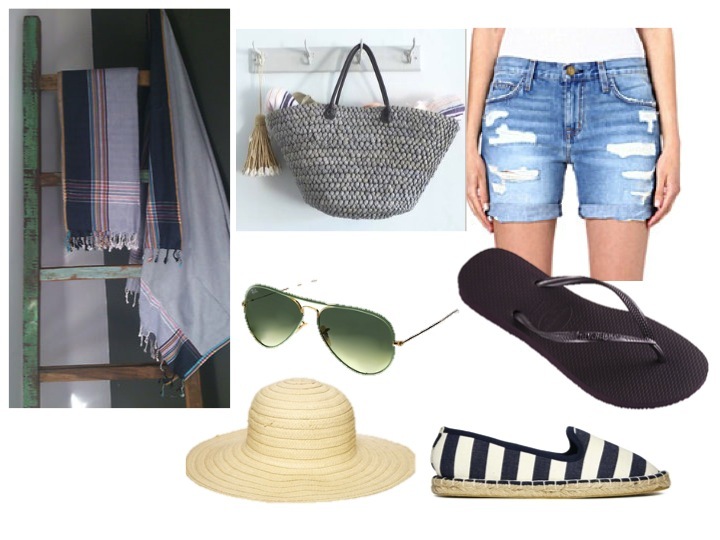 Easy to throw on too when going from beach to restaurant. Shoes, Hats, Accessories etc. Use your beach bag/basket as your hand luggage, as they are nice and big you can chuck a lot in there. Wear your clumpiest shoes for the journey (my feet also get cold on aeroplanes so I always like to wear closed shoes). Wear all your accessories and your hat 😉 These sarong’s are the best, they are so useful, can be used to lie on at the beach, dry yourself with them, use it as a scarf/pashmina or just as a sarong. I have gazillions of them in different colours but really you just need one. Denim shorts are just like jeans for summer. They are an investment! You will wear them year after year. Find a good pair that suit your figure. They come in so many different lengths and styles and like jeans can be dressed up or down, worn with heels or flats and never crease or show the dirt. LINEN: All you need to know! Oh woolies you do surprise! Love this jacket similar to one in my blog post a week ago.